The strange aurora named Steve put on a show on Sunday, May 6. The past weekend was a good one for Northern Lights here in Alberta and across western Canada. A decent display lit the northern sky on Saturday, May 5, on a warm spring evening. I took in that show from a favorite spot along the Red Deer River. The next night, Sunday, May 6, we were hoping for a better show, but the main aurora never amounted to much across the north. Instead, we got a fine showing of Steve, an unusual isolated arc of light across the sky, that was widely observed across western Canada and the northern U.S. I caught his performance from my backyard. 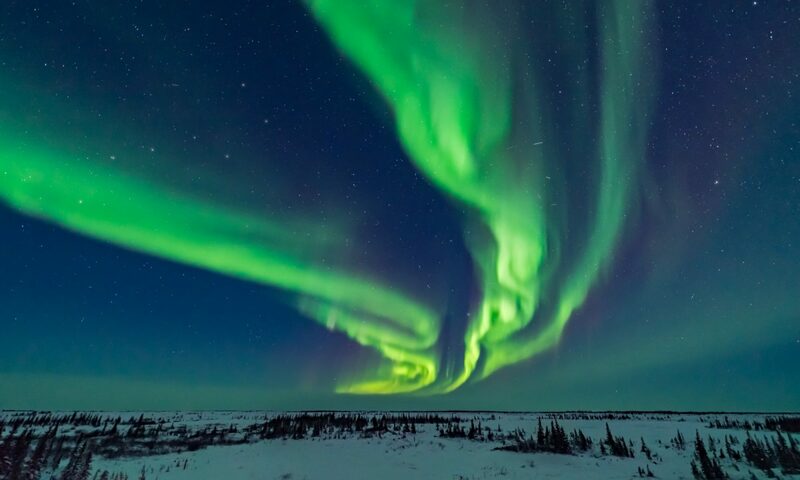 Popularized by the Alberta Aurora Chasers Facebook group, Steve is the fanciful name applied to what still remains a partly unexplained phenomenon. It might not even be a true aurora (and it is NOT a “proton arc!”) from electrons streaming down, but a stream of hot gas flowing east to west and always well south of the main aurora. Thus Steve is “backronymed” as Strong Thermal Emission Velocity Enhancement. To the eye he appears as a grey arc, not doing much, but fading in, slowly shifting, then fading away after 30 to 60 minutes. He doesn’t stick around long. The camera reveals his true colours. This is Steve to the west, displaying his characteristic pink and white tints. But overhead, in a fish-eye lens view, he displayed ever so briefly another of his talents – slowly moving fingers of green, called a picket fence aurora. It was appropriate for Steve to appear on cue, as NASA scientists and local researchers who are working on Steve research were gathered in Calgary to discuss future aurora space missions. Some of the researchers had not yet seen Steve in person, but all got a good look Sunday night as they, too, chased Steve! I shot a time-lapse and real-time videos of Steve, the latter using the new Sony a7III camera which can shoot 4K videos of night sky scenes very well. The final video is here on Vimeo. Steve Aurora – May 6, 2018 (4K) from Alan Dyer on Vimeo. It is in 4K, if you choose to stream it at full resolution. With summer approaching, the nights are getting shorter and brighter, but we here in western Canada can still see auroras, while aurora destinations farther north are too bright and lack any night skies. Plus our latitude south of the main auroral oval makes western Canada Steve country! Faint sounds of Nature ground Steve to our earth. Beautiful. Many thanks again. Spectacular photos of Steve! Love it and so grateful for your explanation and willingness to inform and share.